Libby Houston is one of the subjects carved into the large oak bench that I've been working on. She has had six books of poetry published as well as being a winner of the prestigious H.H. Bloomer award, which is given by the Linnean society to 'an amateur naturalist who has made an important contribution to biological knowledge'. It was a bit nerve-wracking for me, as this was the first time that I've actually shown someone a carved portrait that I've done of them. Libby seemed to like it though...Phew! I've also carved two lines from her poem 'The Trees Dance' onto the tops of the backrests. Libby looked over the text to be carved about her on a previous visit, which meant that I don't need to worry about any inaccuracies too much! It was great chatting with her about the rare and unusual trees and plants that can be found in the area. 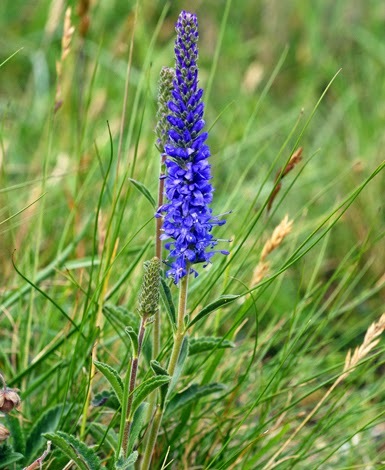 One that was mentioned is Spiked Speedwell, which is rare and lives on the rock faces in the Avon Gorge. This plant colonised the area just after the land was stripped bare by the glaciers of the last Ice Age. 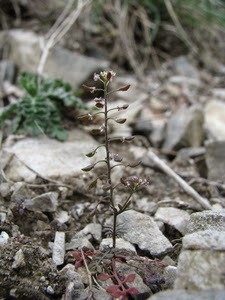 It is at home on steep rock faces and very thin soils, so survived in the Gorge when other plants and trees took over elsewhere in the area. It is also perennial, so it grows back from the same rootstock every year. Libby said that there is debate amongst botanists as to how long these plants can live for and some believe that in favourable conditions, such as in the Gorge, individual plants could be thousands of years old, possibly even 10,000 years. This is impossible to test at the moment as far as I know but if it is true, it would mean that the plant seen now is exactly the same one that started growing next to the retreating ice sheet! We also chatted about Hutchinsia, a tiny perennial flower that lives its life cycle through the winter to avoid competition from other plants. It starts growing in autumn and flowers in March. By springtime, when everything else begins their season, it is done for the year and dies back. Whitebeams are also a bit unusual in the natural world, as they will hybridise with certain other species (such as the Wild Service Tree Sorbus torminalis) and produce fertile offspring. Usually when species interbreed, the offspring are sterile. An example of this would be mules, the result of a horse breeding with a donkey. Nearly all mules cannot produce offspring themselves. Whitebeams are also often found on steep slopes and thin soils, where they can live without being overshadowed and having to compete for resources with larger trees such as ash, beech or oak. This local high density of population, together with their fertile hybrid offspring, means that they often interbreed and produce new species. There are at least three unique species in the Avon Gorge alone. One of the Whitebeam species has possibly my favourite name of any tree. It grows near Watersmeet, on Exmoor in the Southwest of England, and is called the 'No Parking Whitebeam' (Sorbus admonitor). Why the strange name? The first example was found next to a road and had a 'No Parking' sign fixed to it. Libby also kindly gave me two fallen leaves from a Whitebeam tree that she discovered in the Avon Gorge to copy in a woodcarving on the bench. It is named 'Houston's Whitebeam' after her. There is only one specimen of this kind of tree known to exist, so I suppose it must be one of the rarest trees in the world. By the way, the piece of dowel next to the leaf on the right is plugging a hole left when I dug some lead shot out of the wood. I wonder how long it had been in there? One of the more unusual things that I've carved an inscription onto! This commission involved carving a message onto the ash wood handle of a garden fork, together with the emblem of a local cricket club. The emblem was carved using traditional hand tools and was then painted by hand. The lettering was done with a Dremel. I've been very busy for the last month or two working on a big new bench that will go onto the Downs. Very few large pieces of sculpture are allowed to be permanently placed there, so it's a really exciting project. The bench is made from oak that grew nearby and it was milled near Chelvey, just down the road. The work on making the bench has been done at my studio at Bower Ashton, so it really is a local bench for Bristol. 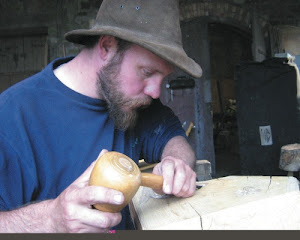 I'm carving one of the two backrests in the photo above. Each is about 2.5 metres (about 8 feet) long and 7.5cm (3") thick. Pretty sturdy! The bench is scheduled to be finished by December and then installed in the children's playground next to the Observatory and the Suspension Bridge in March 2015. It will be a cross between an information board and a bench, so people can read about wildlife and people associated with the area while having a comfy place to sit. There will also be a 'treasure trail' of carved little spiders for visitors to find; some easy to spot, some not so easy! The purseweb spider, a tiny relative of tarantulas that lives in the Avon Gorge. Carving one of the bearers that will hold the bench up. It shows a brachiopod, a shellfish that is found fossilised in the Carboniferous limestone under the Downs. Much larger than life-sized though! This bearer shows the coral Lithostrotion, also found in the Carboniferous limestone. Chalkhill Blue butterflies live in the Gorge. They are nationally uncommon, living in very specific areas in the south of England. Libby spends much of her time abseiling into the Avon Gorge and mapping the rare plants that live there. For her work, she was awarded the prestigious H.H. Bloomer award by the Linnean society. Amongst other achievements, she has discovered some of the very rare hybrids of Whitebeam trees that grow in the hard-to-reach parts of the Gorge and nowhere else, one is even named after her: Sorbus x houstoniae. There is only one specimen of this tree known to exist and Libby kindly gave me some examples of its leaves to copy. Francis Greenacre has been a great help, providing feedback, liaising with the members of the Clifton and Hotwells Improvement Society (who commissioned the bench) and also supplying very useful images and ideas, particularly about Brunel's designs for the Suspension Bridge. Thanks also to RoseMary and Linda of CHIS, for meeting and chatting about ideas. Ray Barnett, Mark Pajak and Isla Gladstone at Bristol Museum and Art Gallery all gave their time to meet and discuss ideas and images for wildlife and fossil subjects to use. Mark and Isla also supplied very helpful images to use. Dr Clive Lovatt, Richard Bland and Linda Edwards helped in researching the poetry featured on the bench, as well as supplying information about local poet Peter Gabbitass who is one of the subjects. Libby Houston very kindly gave permission to use her poetry and supplied leaves to copy, as well as explaining her work and checking the facts were correct! It was great to meet her. Thanks also to Joe Cooper of Touchwood Enterprises, Andy O'Neill and Sam Mond, without whom I might not have had any local timber to carve into in the first place.